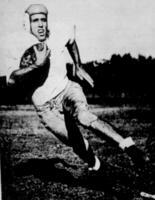 Milton Rathbone will always be remembered as the quarterback who led the underdog San Angelo Bobcats to the 1943 state championship. Running San Angelo’s T-formation offense Rathbone had three touchdown passes in a first-round win over Ysleta. In one of the most thrilling games in state history, San Angelo knocked off a favored Highland Park team that featured Bobby Layne and Doak Walker, 21-20. Rathbone scored the game-winner late in the fourth quarter on a busted play when his pitch hit the referee and he picked it up and ran it in. In the state championship game, Rathbone threw three touchdown passes to Ken McCarley as San Angelo defeated a favored Lufkin team, 26-13, before a crowd of 11,000. The Bobcats finished the season with a 14-0 record. Rathbone made the all-district, second-team all-state and all-Southern teams. After high school he served in the Navy during World War II. When he returned home, he played football at San Angelo Jr. College and then transferred to Texas Tech where he lettered in 1949.